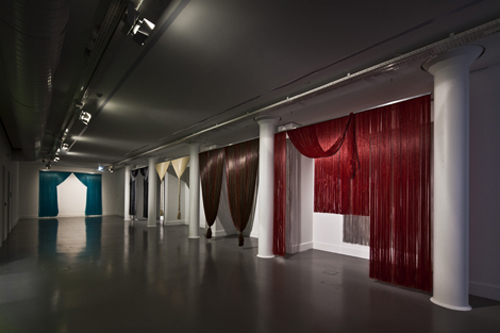 The latest in Arter’s new commissioned series of solo exhibitions is Nevin Aladağ’s “Stage,” six installations, made of brightly colored artificial hair, that mimic the look of stage curtains. The works frame the walls of the space and offer multiple outlets—a crimson, fringed opera-style drape; maroon pigtails reminiscent of an amateur theater prop; and an azure blue clownish bob—to provide for a variety of potential performances and audiences. References to women’s hair coverings, cloths, or wigs are often a clichéd and complex topic in Turkey. But Aladağ sidesteps this debate by composing an eccentric and playful scene, where fake tresses (usually a substitute material for real hair) replace the fabric that both conceals and also opens upon dramatic performance. Concurrently, Aladağ is also exhibiting her work at Rampa. Here photographs, sculptures, and a video make evident Aladağ’s interest in performance as a structuring device for her output. Her physical works are not simply traces of performance, but interventions that result from or encourage action. A new piece produced for this show, Leaning Wall, 2012, is again an installation of colorful elements. Eighty-four ceramic body imprints in seven different pastel hues are hung across one length of the gallery and recall the holds of a climbing wall. Yet visitors are not invited to climb it; instead the more leisurely and sophisticated act of “leaning” is encouraged. Comical as it is to lean one’s face or shoulder into an imprint, there is more at issue here: With this work—as with the hair in “Stage”—Aladağ cleverly recomposes an existing bodily extension, in form and function, to draw the viewer into a curious play that is too enticing to refuse to be a part of. This exhibition is also on view at Rampa, Şair Nedim Caddesi No: 21a, until May 26.